Gary Rome Hyundai Dealer Blog - A Gary Rome Hyundai Site (888) 637-4279: Hyundai Headquarters come to the rescue! Nathan Schwab and his wife Michelle Fanucci apparently share their cat’s gift of nine lives. All three survived an accident on the 405 Freeway that easily could have killed them and others. That’s the good news. The bad news -- for six long days -- was that the terrified cat ran off and remained elusive. And then came more good news: Security guards at Hyundai Motor America managed to capture Garfield early Saturday morning after a massive cat-hunt. His owners retrieved him at 1 a.m.
"He hasn't stopped purring," Fanucci said. Hyundai employees forged a search-and-rescue team last week to try to corner Garfield, whom security personnel had spotted several times on the company’s 17.9-acre Fountain Valley property. On Friday, Schwab joined about two dozen employees in circling the perimeter of the facility and peeking under cars in the covered parking lot. 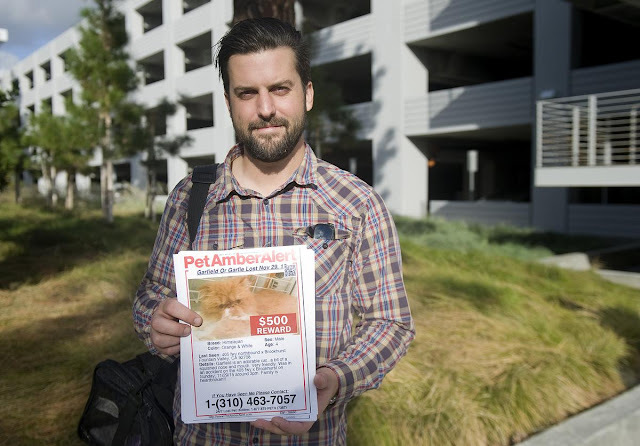 “In the midst of such tragedy with the San Bernardino shooting, it’s truly extraordinary to see strangers care about someone’s beloved missing cat,” Fanucci said. The unlikely set of events precipitating Garfield’s escape occurred Thanksgiving weekend on the afternoon of Nov. 29. Schwab, 30, and Fanucci, 31, were driving in the carpool lane to their Santa Monica home after visiting family in San Diego. Near the Brookhurst Street off-ramp, a sedan traveling next to them spun out of control and clipped their Ford Ranger – which rolled seven lanes across the freeway, somehow missing other vehicles. At some point, Garfield – an orange Persian with a grumpy face – fled through a broken window. The couple sustained relatively minor injuries. The other driver seemed OK, too, Schwab said. Once home, Schwab offered a $500 reward in a Facebook post that was shared by Fountain Valley animal lovers. The next night, a Hyundai security guard saw Garfield in the brush. More sightings continued throughout the week. Employees put out food and water for the cat. “We had our maintenance workers cut back bushes so we could see better,” said Hyundai spokesman Jim Trainor. The company allowed Schwab to set up a trap and distribute fliers. The cat paid a visit to his veternarian Saturday morning. Like his humans, who are experiencing back pain from the accident, he suffered minor injuries. "He has a cut on his hip and can't jump," Fanucci said. Reunited with their furball, she and her husband feel even luckier. “Garfield is just a friendly, mellow cat – a purr box,” Schwab said, who delivered the award money to the rescuers. “We are so relieved he is back with us."